Left: Mary Green, Untitled (Stick Insect), 1910-11. Collection of Sarjeant Gallery Te Whare o Rehua Whanganui. Gifted by Lilian Smith. Right: Vivian Smith, Portrait of Mary Green, 1917. Collection of Sarjeant Gallery Te Whare o Rehua Whanganui. Gifted by Lilian Smith. Insects are not usually welcome in an art gallery because they can cause significant damage to artworks. However there are some insects that we actively care for within our walls, including some beautiful insect studies by Mary Green. Born in July 1892 Mary was the eldest daughter of Alice and Henry Charles Green. Around 1910 she enrolled at the School of Art at Wellington Technical College where she attended day classes covering a diverse range of subjects including life drawing, anatomy, plant and animal studies, design, modelled design, and jewellery. As part of her academic programme Mary also sat the South Kensington Science and Art Examinations, for which she received first and second class passes in a number of fields. Her name also repeatedly appears in the prize lists for both the Wellington Technical College and the student competitions held by the New Zealand Academy of Fine Arts between 1911 and 1914. Mary Green, Untitled (Weta), 1910-11. Collection of Sarjeant Gallery Te Whare o Rehua Whanganui. Gifted by Lilian Smith. The insect studies held in the collection of the Sarjeant Gallery Te Whare o Rehua Whanganui were produced by Mary at the age of 18, most likely as a student at the Technical College. 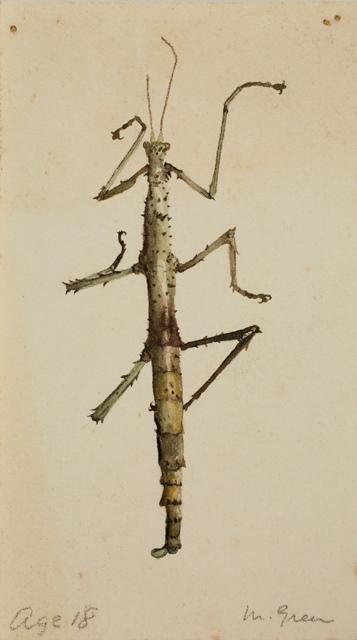 Completed in either late 1910 or early 1911, the studies consist of a small watercolour of a stick insect, and pencil sketches of a weta and two beetles. Each of the drawings shows an interest in capturing not only the form of the insect but also its surface texture – from the prickliness of the stick insect to the lustre of the weta’s thorax and the beetles’ wings. 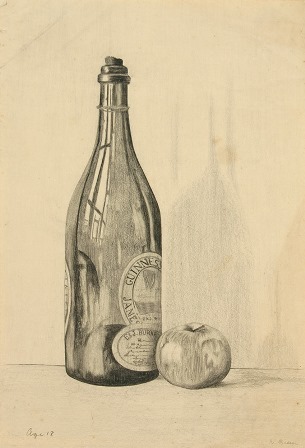 Other drawings that Mary produced at age 18 also showcase the development of this skill. Among my favourites are a wonderful drawing of two feathers that conveys something of the softness and sheen of the originals and a lovely still life depicting a bottle and apple that explores the relationship between opaque, semi-translucent and reflective surfaces. In contrast to her time as a student, relatively little is known about Mary’s work as an artist following the completion of her studies. 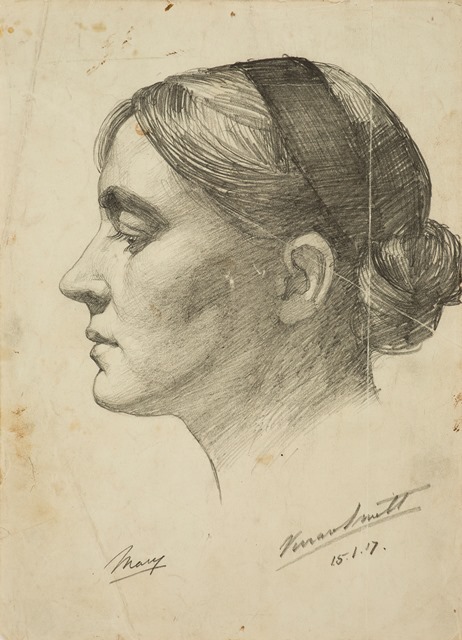 From contemporary newspaper cuttings we know that she continued to exhibit her work in the years immediately after, with some of her drawings, paintings and sculptures included among those displayed at the New Zealand Academy of Fine Arts during their annual exhibition in both 1916 and 1917. On 22 December 1917 Mary married fellow artist Vivian Smith (1883-1946) in Wellington. Having been called up for active service, Vivian subsequently served two years abroad. He returned in late 1919 and a year later the couple’s daughter, Lilian, was born. In 1932 the family relocated to Whanganui, where Vivian took up the position of Art Master at Wanganui Technical College. Upon his death in 1946 Mary took up the role, serving for a number of years. She died at her home in Oakland Avenue in late April 1977. The wonderful paintings, drawings and sculpted bust portrait by Mary that are today held in the Sarjeant collection were later bequeathed alongside a substantial body of Vivian’s work by Lilian in 1983.